It has been my wish in this book, to take the reader back nineteen centuries; to show him Jerusalem as it was, when our Lord passed through its streets, and the Sanctuary, when He taught in its porches and courts; to portray, not only the appearance and structure of the Temple, but to describe its ordinances and worshippers, the ministry of its priesthood, and the ritual of its services. In so doing, I have hoped, not only to illustrate a subject, in itself most interesting to the Bible-student, but also, and chiefly, to sketch, in one important aspect, the religious life of the period in which our blessed Lord lived upon earth, the circumstances under which He taught, and the religious rites by which He was surrounded; and whose meaning, in their truest sense, He came to fulfil. 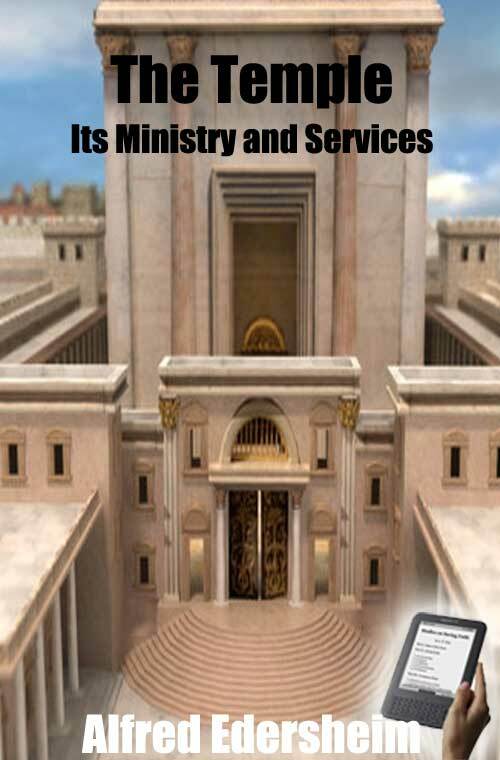 The Temple and its services form, so to speak, part of the life and work of Jesus Christ; part also of His teaching, and of that of His apostles. What connects itself so closely with Him must be of deepest interest. We want to be able, as it were, to enter Jerusalem in His train, along with those who on that Palm-Sunday cried, 'Hosanna to the Son of David'; to see its streets and buildings; to know exactly how the Temple looked, and to find our way through its gates, among its porches, courts, and chambers; to be present in spirit at its services; to witness the Morning and the Evening Sacrifice; to mingle with the crowd of worshippers at the great Festivals, and to stand by the side of those who offered sacrifice or free-will offering, or who awaited the solemn purification which would restore them to the fellowship of the Sanctuary. We want to see these rites, as it were, before us—to hear the Temple-music, to know the very Psalms that were chanted, the prayers that were offered, the duties of the priesthood, the sacrificial worship in which they engaged, and the very attitude of the worshippers—in short, all those details which in their combination enable us vividly to realise the scenes, as if we ourselves were present in them. For, amidst them all, we ever see that one great outstanding Personality, Whose presence filled that house with glory. The New Testament transports us into almost every one of the scenes described in this book. It also makes frequent reference to them for illustration. We see the father of John ministering in his course in the burning of incense; the Virgin-Mother at her purification, presenting her First-born; the child Jesus among the Rabbis; the Master teaching in the porches of the Temple, sitting in the Treasury, attending the various festivals, giving His sanction to the purifications by directing the healed leper to the priest, and, above all, as at the Feast of Tabernacles, applying to himself the significant rites of the Sanctuary. And, as we follow on, we witness the birth of the Church on the day of Pentecost; we mark the frequent illustrations of spiritual realities by Temple-scenes, in the writings of the apostles, but more especially in the Book of Revelation, whose imagery is so often taken from them; and we still look for the accomplishment of the one yet unfulfilled type—the Feast of Tabernacles, as the grand harvest-festival of the Church. I have thus placed the permanent Christian interest in the foreground, because it occupied that place in my own mind. At the same time, from the nature of the subject, I hope the volume may fulfil yet another and kindred purpose. Although it does not profess to be a Handbook of Biblical Antiquities, nor a treatise on the types of the Old Testament, both these subjects had to be constantly referred to. But to realise the gorgeous Temple ritual, in all its details, possesses more than a merely historical interest. We are indeed fascinated by it; we live over again, if not the period of Israel's temporal glory, yet that of deepest interest to us; and we can vividly represent to ourselves what the Temple had been before its services had for ever passed away. But beyond this, stretching far back through the period of prophets and kings, and reaching up to the original revelation of Jehovah amid the awful grandeur of Sinai, our holiest recollections, and the very springs of our religious life rise among these ordinances and types, which we here see fully developed and carried out, and that under the very light of His Presence, to Whom they all had pointed. I say not, whether or how far later Jewish practice may have misapprehended the original import or the meaning of the Divine ordinances. That was beyond my present task. But an accurate acquaintance with the sacrificial services at the time of Christ must not only tend to correct mistakes, but throw a fresh and vivid light upon all, and influence our views of what the Levitical ordinances were intended to be and to teach. To have thus stated my object in this book, is also to have indicated its difficulties. Yet abundant materials for such a work, though scattered far and wide, are within our reach. Not to speak of contemporary writings, as those of Josephus and Philo, and references in the New Testament itself, we have in the Mishnah a body of authoritative traditions, reaching up, not only to Temple-times, but even to the days of Jesus Christ.p1 On this source of information, of course in conjunction with the Old Testament itself, I have been chiefly dependent. place here the writings of Maimonides, not only because he is of greatest authority among the Jews, but because his vast and accurate knowledge of these subjects, and the clearness and subtlety of his intellect, entitle him to that position. Next to him come the numerous writers on Biblical Antiquities, in Latin and German; works on Typology—scientific and popular; treatises on the Life and Times of our Lord; histories of the Jewish Nation, or of Judaism; commentaries on such passages in the Old and New Testament as bore on these subjects; and numerous treatises on cognate points. In my study of ancient Jerusalem, I had the benefit of the labours of recent explorers, from Robinson and Barclay to the volumes published under the auspices of the Palestine Exploration Fund. To the Cyclopaedias of Winer, Herzog, Ersch and Gruber, Dr. Smith, and Kitto (the third edition), I have been greatly indebted. The last-named of these works has the special merit of a series of articles on Jewish subjects (as I may designate them), written in quite an original manner, and with most competent knowledge. Although, as will appear from the text, I have been obliged frequently to differ from their writer, yet these articles must, from the fulness and ability of their treatment, be of very great use to the student. Lightfoot's Horae Hebraicae et Talmudicae are known to every scholar. Not so, perhaps, his small learned treatise De ministerio templi. The title and many of the subjects are similar to those treated in the present volume. But the learned reader will at once perceive that the plan and execution are quite different, though the work has been of great service to me. Perhaps I ought not here to omit such names as Relandus, Buxtorf, Otho, Schottgen, Meuschen, Goodwin, Hottinger, Wagenseil, and Lundius; and, among modern writers, Bahr, Keil, Kurtz, de Wette, Saalschutz, Zunz, Jost, Geiger, Herzfeld, and Fratz, of whose works I have, I may say, constantly availed myself. Many others have been consulted, some of which are quoted in the foot-notes, while others are not expressly referred to, as not adding anything material to our knowledge. In general, I should explain, that I have acted on the principle of giving the minimum of references possible. It would have been easy to have multiplied them almost indefinitely. But I wished to avoid cumbering my pages with an array of authorities, which too often give a mere appearance of learning; and, while they are not needed by scholars, may tend to interfere with the more general and popular use of such a work. For a similar reason, I have throughout avoided the use of Hebrew and even Greek letter-press. To print an expression in Hebrew letters could not be necessary for students, while the general reader, whom it too often bewilders by a show of knowledge, must in such case necessarily pass it over, unnoticed and unknown. While this book embodies the studies of many years, I have during its actual composition deemed no labour nor pains irksome in comparing the results of my own investigations with those of all, within reach, who were entitled to such consideration. Thus much for the matter of the book. As to its form, some subjects may be touched in it which do not equally interest all readers;p2others may appear to have been treated with too little or else with too much detail; objections may be raised to interpretations of types, or even to the general view of the Old Testament which has been taken throughout. My aim has been to make the book as complete and generally useful as I could, and clearly to express my convictions as to the meaning of the Old Testament. But on one point especially I would wish to be quite explicit. At the close of these studies, I would say, with humble and heartfelt thankfulness, that step by step my Christian faith has only been strengthened by them, that, as I proceeded, the conviction has always been deepened that Christ is indeed 'the end of the Law for righteousness,' to Whom all the ordinances of the Old Testament had pointed, and in Whom alone, alike the people and the history of Israel find their meaning. Viewed in this light, the Temple-services are not so many strange or isolated rites, for the origin of which we must look among neighbouring nations, or in the tendencies natural to men during the infancy of their history. Rather, all now becomes one connected whole—the design and execution bearing even stronger evidence to its Divine authorship than other of God's works,— where every part fits into the other, and each and all point with unswerving steadfastness to Him in Whom the love of God was fully manifested, and its purposes towards the world entirely carried out. From first to last, the two dispensations are substantially one; Jehovah, the God of Israel, is also the God and Father of our Lord and Saviour Jesus Christ—Novum Testamentum in Vetere latet; Vetus in Novo patet.